STAMPA S.A., was founted in 1976, in Athens. For more than 30 years the company focuses on developing high quality products for suspended ceiling and partition industry. The understanding of our customer needs, our specialization ceiling and partition solutions, our technologically advanced mashinery, but mostly our people quarantee that we will continue to be considered as one of the most reliable companies in the market. 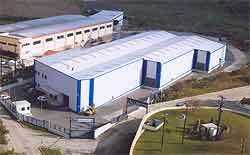 Complete package solutions that minimize the possibility of construction failure offering unique results in combination with elegance that characterizes the company's products. Is there anyone who believes that a company that produces and sells building materials since 1976, would exist today if the quality of its products was not guaranteed? In the area of manufacturing the delivery time is the most non-negotiable factor because any investment should begin to deliver profit as soon as possible.